Every year thousands of tech companies descend upon Las Vegas for CES to celebrate all things tech. Established companies present their latest products, and startups have the opportunity to reach more people. Participants and attendees include auto manufacturers, newborn startups, investors, specialized media, tech aficionados, and more. Two months ago, 180,000 attendees from over 100 different countries gathered to share projects. My country, France boasted the second-highest attendance numbers after America. That is due in part to the fact that France just opened the biggest startup accelerator of the world: Station F in a former train station facility (more info here in this article from TechCrunch) and France also created a new special Visa for startup founders, tech talents and tech investors willing to join France (more info here). While that’s a big win for France, WordPress really took home the CES gold. If there is one thing I learned over the past year, it’s that when you’re talking about tech, there is always WordPress somewhere. WordPress already controls 27 percent of the Internet but the CMS isn’t giving up and as we saw during the conference, has begun going after the rest of the web. So no big surprise, WordPress is related to a major Tech event or hot tech hub. CES took place two months ago, so why are we still talking about it now? While there, I heard about two promising WordPress companies, who are doing even better than expected. Both of these startups show not only the power of tech but the power of WordPress and open source. Here are two companies using WordPress to change the world. AMA is a French company, based in Rennes, that originally developed a mobile game and app. In 2016, they shifted to smart glasses with Xpert Eye, a mobile, hands-free, video conferencing solution, working closely with industry partners: ODG, Vuzix, Google. AMA develops a tailor-made solution to address the needs of various industries from telemedicine to maintenance, insurance, or even education. At CES 2017, they performed a live demo of their See-What-I-See solution. The company is growing quickly and really making advancements. Most exciting of all, AMA’s website is built on WordPress and they’re using Weglot to support their international presence. They’re currently present in six locations (Rennes, Boston, London, Bucharest, Cologne, Bari), aiming to become a worldwide market leader. WordPress was an obvious pick for AMA. The company needed a scalable solution that can reach anywhere in the world. 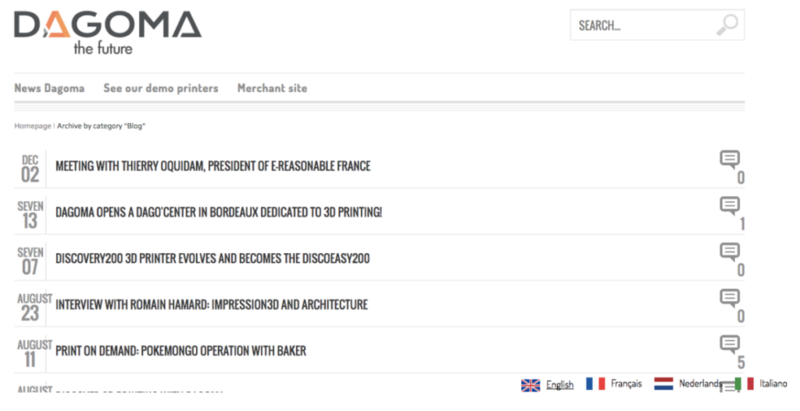 Dagoma is a French startup, based in Roubaix, that develops, manufactures and commercializes made in France 3D printers. They recently raised €3 million, to strengthen the team and open new development and production center in France. At CES they released their latest 3D printer, the NEVA focusing on user experience. It’s easy to use, market ready, and the cheapest option on the market. They’re using WordPress and Weglot for their blog, and are able to make it available in different languages. This gives them the ability to sell printers worldwide. I’m very proud to present these two case studies of WordPress supporting their early success stories internationally. It clearly demonstrates how far you can go building your online presence with leading top notch CMS, WordPress. It allows anyone to support their dreams and make a scalable, easy to manage, international website. Augustin is a web entrepreneur and tech enthusiastic. He co-founded Weglot Translate multilingual plugin to offer a tech-savvy solution to manage and display a website in any languages.